My department head convinced me and another senior in the Computer Science department to be "career panelists" at a local one-day conference meant to introduce science careers to middle school girls. Sometimes CS gets left out of the "STEM" conversation, and this event was a good example: my classmate and I were the only advocates for computing, and there were no technology workshops at all, despite hands-on virtual reality and robotics events being advertised. There were fantastic astronomy, biology, and chemistry workshops however. I mentioned this to the organizer, and she reminded me that it was a completely volunteer-run event, and no one volunteered to offer technology workshops. I wondered how much responsibility the organizers had for reaching out to people in technology, or in that case reaching out to minority speakers (all presenters I saw were Caucasian, while the students were 90% Latina), but that's for another blog post. 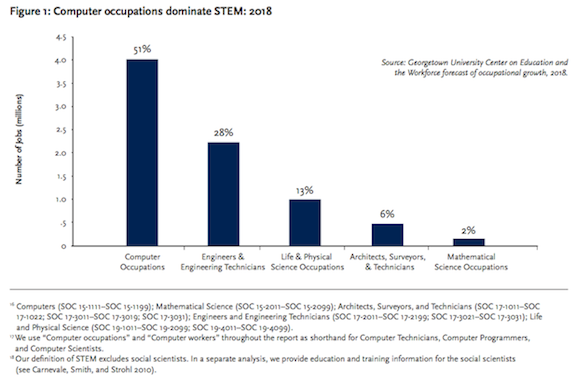 In any case, by some estimates computing jobs will be 50% of all STEM jobs by 2018, so we better get on this! Izzy and I were on the task as Computer Science evangelists. Below the jump is the text of my talk. Hi I'm Katie Cunningham, and I'm currently a researcher in a computational biology lab at the UofA. Right now I'm improving a program that can determine demographic history, like population size change or migration, based on differences in DNA. I also have a side project writing a program that will help biologists find information about certain genes more quickly. I'm going to apply for jobs outside Tucson later this semester. My plan is to work for a couple years and then attend graduate school. What's my path been like? I did the WISE mentoring program as a senior in high school! I noticed that my friends who seemed like science superstars were doing WISE, so I wanted to as well! I took some advanced classes when I had the chance, and not just in science. I really liked taking history classes, for example. If you're in a position to take the more advanced class, I recommend going for it. Getting a good foundation in math while in high school was also very helpful for me. I chose the UofA because I knew that I could get a good education and have many opportunities to do research as an undergraduate—and both turned out to be true! One thing I hadn't realized in high school was that I would also have a lot of opportunity to participate in clubs, community service, and outreach. For example, I wanted to put on Saturday workshops about computer programming for students who had no prior programming experience, and I was able to get a room and some financial support to do that through the Computer Science department. I think to get the most out of attending the UofA, it's important to go and seek out experiences like research, leading a club, or teaching. I came in to the UofA knowing that I wanted to do science but unsure what sort of science. I figured I should just choose something, so I chose biochemistry because it seemed like I could study the basics of how life worked. An event that really changed my trajectory was in the second semester of my freshman year. I decided to take an introductory computer science course, just to try out programming, because I thought it might be interesting. I loved it! It was really fun, and I actually liked doing my homework. I felt like it was applied and practical, which I liked, but it also had a little flavor of math, which I thought was cool. (I'm a dork, right?) I took two more computer science courses and then decided that I should change my major to the field that I enjoyed the most. I'm still hooked on computer science. Programming was like the appetizer, but for me, the most exciting stuff has been thinking about how information and algorithms matter in real life—like, how can you break something down into only its most essential bits of information? Or, exactly what steps are needed to do a process, and now that we've figured that out, can we make it faster? These are the sorts of things you think about in computer science. I wanted to find a career where I could use computer science to make the world a better place. I realized that I could combine computer science with the biology I was studying, in a new field that I had found through Googling: computational biology! By combining the problem-solving techniques of computer science and the data of biology, it was possible to make new sorts of discoveries. Biology is very complicated——it seems clear that modern biology will require heavy use of computers to sort it all out. I'm very excited about the future of this field, and I'm seeing graduate programs in this area grow around the country. I'm also looking at potential jobs that combine computer science and biology, including a position at a startup that produces custom strains of bacteria, a small company that makes genetic tests for rare diseases, and research at national labs. More generally, I've found that having experience in computer science has really opened doors for me, so I wanted to take some time to emphasize the importance of having computer science on your tool belt as a scientist. I believe—and don't just take my word for it, I've heard it from many knowledgeable folks—that the people who are really going to change the world in the next few years are the ones that take computer science and apply it to existing fields, from medicine to math to biochemistry. There's so much potential in the combination of computer science with other scientific fields, you can do groundbreaking things with technology that is fun and allows you to create whatever you want. I hope you'll take my advice and take a computer science course in college, to see if it's something that gets you excited too.